I loved my wedding dress. 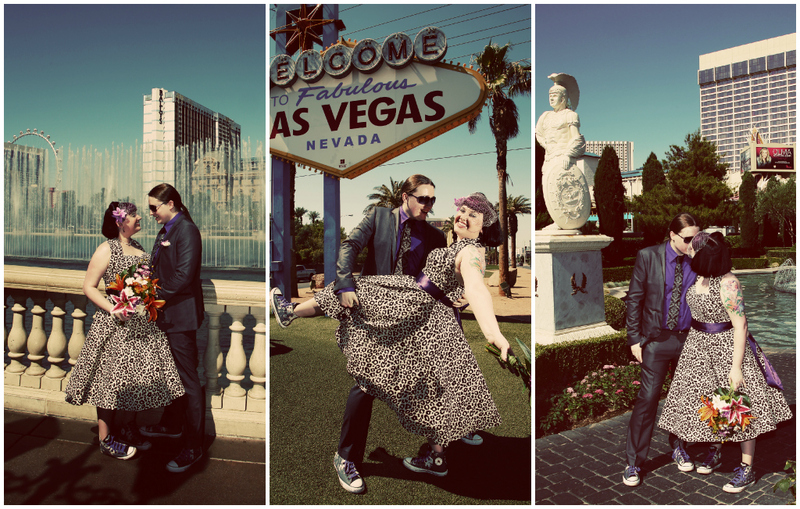 Combine my love affair with the era with our wedding location – Las Vegas, a place that was utterly transformed in the 1950s – rocking the 1950s style was a no-brainer. Las Vegas still oozes that vintage charm in places, especially when you head to places like Fremont Street. I can’t forget about the National Atomic Testing Museum either, where you can learn about the um… explosive… parts of the 1950s Vegas experience. Cutesy and tacky atomic branding really tickles my fancy, just like jukeboxes, big American cars and Elvis Presley. 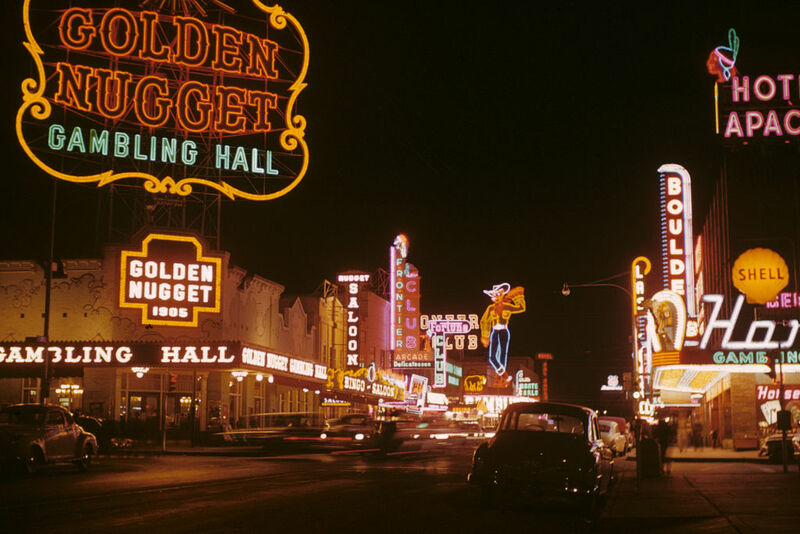 The Las Vegas of today and the Las Vegas of the 1950s walks a very fine line between glamour and tackiness, much like 1950s style with an alternative twist. It’s the perfect melting pot of glamour and kitsch – what’s not to love? As far as 1950s makeup goes, you can’t really mess it up! A clean and simple base, with neat brows, a good cat eye and strong lips. My wedding makeup wasn’t too far removed from my day-to-day makeup, and fit perfectly against my fifties dress and twirly petticoat. 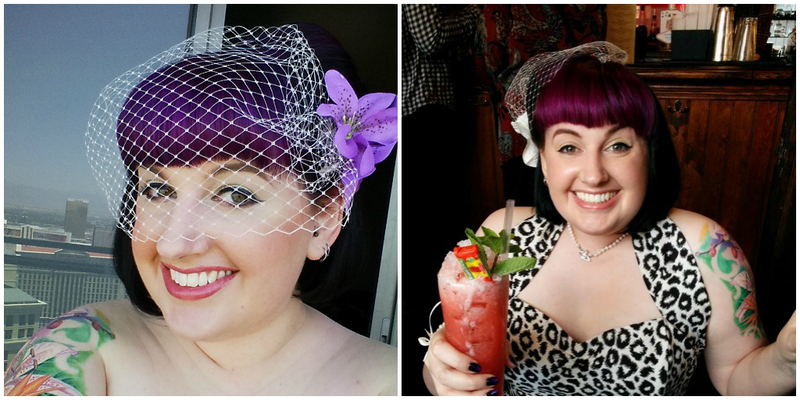 It was the best mix of timeless glamour and kitschy fun! The only thing I’m really lacking is a bold lip, but that’s more a personal taste thing. I’m wearing an e.l.f liquid lipstick in these photos, in a subtle pink shade called Raspberry. I’ll admit, it may have fallen victim to a few cocktails in the right hand photo… Truth told, it’s only recently that I’ve had the confidence to experiment with more vibrant and stand out lip colours. If I were re-working this, I’d be tempted to go with something like the Makeup Revolution’s Salvation Velvet Lip Lacquers – paint on liquid lipsticks that dry down to a perfect matte finish. One of the bold pinks or reds would be a real showstopper! On a more casual level, I think it’s really easy to pull elements of 1950s style into your look. My rule of thumb would be stick with the silhouette then add some of the fun tackiness with prints, or some of the OTT glamour with jewellery. I have lost count of the amount of fitted tropical print skirts and leopard print cardigans I own! Not to mention the amount of kitschy costume jewellery I have knocking about – I’m a sucker for sparkly things and unusual pieces! I’d love to hear what results you get in the find your style era quiz. Do you think it’s accurate? How would you describe your personal style? Update: The Find Your Style Era contest is now open! 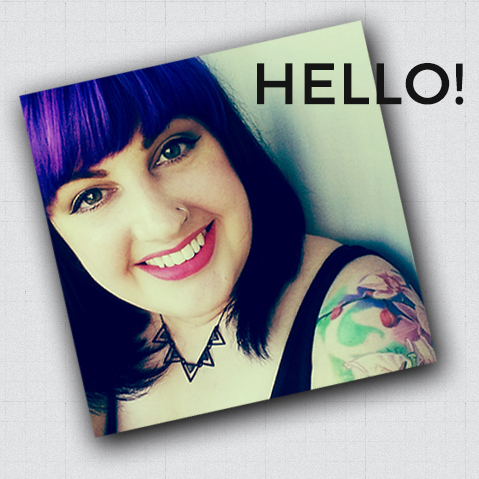 If you liked this post, I’d love it if you could vote for me – click here to see the entries!